The Detroit Red Wings made their first real move a sellers at this season’s NHL trade deadline on Tuesday, sending defenseman Brendan Smith to the New York Rangers for a second round draft pick and a third round draft pick. Pending a trade call (not official until then), DET will get 2nd rder and 3rd rder, both in 2017, from NYR for Brendan Smith. McKenzie later corrected that the second-round pick will be in 2018, as the Rangers gave up their 2017 pick trading for Eric Staal last season. Couple of things on DET-NYR Smith trade. 1. Trade call not yet done. Coming soon. 2. My mistake on 2nd rd pick, 2018, not 2017. Doh. The Wings had previously sent Tomas Jurco to the Chicago Blackhawks, but he wasn’t playing in Detroit anyway so it didn’t mean much. With the Red Wings far out of the playoff picture and the trade deadline just over a day away, this move isn’t entirely unexpected. That said, there was some buzz about the Wings re-signing Smith, though that would have given them a glut of defensemen heading into next season. I like the move. A second rounder plus “something else” was about the most the Wings could have expected for Smith and I like the “something else” being a usable pick (and a decent one at that) rather than a warm body for the rest of the season. Additionally, I was wondering earlier today if the Wings might go for 2018 picks given how the 2017 draft is regarded as shallow. With the Smith deal done, forwards Thomas Vanek, Steve Ott, and Riley Sheahan remain tied to the rumor mill. The Detroit Red Wings signed rookie defenseman Nick Jensen to a two-year contract extension on Monday. UPDATE: The #RedWings today signed defenseman Nick Jensen on a two-year contract extension. As per usual, financial terms of the deal were not announced. Thankfully, the Freep’s Helene St. James had them seconds later. Red Wings have signed defenseman Nick Jensen to two-year extension worth $800,000/$825,000. Would have been UFA this summer. This gives the Red Wings six returning defensemen next season, with Xavier Ouellet still scheduled to become a restricted free agent. I would think this makes trading unrestricted-free-agent-to-be Brendan Smith more likely but this is the team that gave Alexey Marchenko away for free so what do I know? The Red Wings opened up their trade deadline sale on Friday afternoon, sending restricted-free-agent-to-be Tomas Jurco to the Chicago Blackhawks for a third-round draft pick. As I said in my trade deadline preview yesterday, Jurco wanted out and wasn’t getting opportunities in Detroit anymore, so it’s not a surprise to see him dealt. Honestly, I’d expected him to get waived at a handful of points this season, so getting a third-rounder for Jurco is pretty fantastic in my mind. As I said via Twitter, this feels a bit like the Wings dumping Aaron Ward in 2001. A perfectly serviceable player who wasn’t happy in Detroit and will go on to bigger and better things elsewhere. Now it’s up to Ken Holland to do the same thing he did then, turn that draft pick into something useful. The Ward draft pick became Jiri Hudler. Let’s see what this pick becomes. The NHL’s trade deadline is less than a week away and – in the middle of their “bye week” – the team sits last in the Atlantic Division, only two points up on the Carolina Hurricanes (who have four games in hand) for last in the Eastern Conference, and twenty-sixth overall in the thirty-team league. For the first time in a quarter century, the Red Wings will (in all likelihood) not make the playoffs. As such, they’ll be sellers at the trade deadline. Detroit general manager Ken Holland insists that the team will not be torn down in a total rebuild. He expects only to unload “rentals” – players who will be free agents this summer anyway. With that in mind, there are three players who we can probably expect to see moved. Vanek has been one of the Red Wings’ top forwards this season, leading the team in goals with 15 in just 47 games played. He was signed last summer to a cap-friendly one-year deal as a reclamation project and is just the kind of player a team looking to make a playoff push would want to add. The only hiccup is that he reportedly loves Detroit and Holland may choose to simply extend his contract rather than trade him and risk being unable to bring him back this summer. At 28, Smith is no longer a prospect, he’s a known quantity. He could be a solid addition to a team like the Pittsburgh Penguins (who, as I write this, traded for Ron Hainsey), looking to shore up their defense. That said, Holland has stated that he’ll talk to Smith’s camp about a contract extension, so he could stay put. The Red Wings have five defensemen already under contract for next season, plus restricted free agents Nick Jensen and Xavier Ouellet. If Jensen can do Smith’s job at half the price (or less), it makes sense to get what they can for him. Ott signed with his “hometown” Red Wings last summer and was excited to come to Detroit. He clearly wants to be here. I’ve been against his signing from the start. There are a lot of GMs who love the kind of player he is, even if I don’t. He could be a cheap veteran addition for a team looking for a little extra grit. In addition to the above three, there are a few others in unique positions that could see them dealt. Exiled to the Grand Rapids Griffins in the face of a roster crunch in Detroit, Miller has made it clear that he’d like to be traded and get back into the NHL. His position is similar to Ott’s, as a veteran grinder who would come cheap, except for the fact that he already cleared waivers so any team that wanted him will have already passed him up. The Wings would likely have to take a player back in any deal for Miller. Jurco has been stuck in the press box for much of the season and doesn’t seem to have a future in Detroit. He reportedly requested a trade earlier in the year and will be a restricted free agent this summer. That said, if the Wings were to sell on Vanek and Ott, it would seemingly open up a roster spot in Detroit for Jurco to get more playing time. Tatar has been one of the Wings’ top forwards this season but has been plagued at times by accusations of not living up to his potential. He’s a restricted free agent this summer, likely due a raise from the $2.75 million he makes now to something close to the $4.75 million of Gustav Nyquist. The Chicago Blackhawks called about Tatar and Nyquist earlier this season, so if the Wings wanted to avoid paying Tatar, they could ship him out now. Finally, there’s a small group of players that might have value but probably won’t be dealt for various reasons, primarily because – as stated above – the Wings say they’re not tearing the team down. Signed for two more seasons after this one and currently suspended, the Blackhawks did ask about him, so the possibility of moving Nyquist is there. Even more than Tatar, Nyquist can’t shake the “underperformer” label and the Wings may want to dump his salary to facilitate re-signing Tatar (or anyone else). Green has one year left on his contract for $6 million, so any team looking to acquire him wouldn’t be going for a rental. If available, though, he’d be one of the top defensemen on the market and could probably bring in a decent haul for the Red Wings’ reload. It’d also clear a lot of money from the Wings’ cap. I don’t expect him to be dealt but I think it’s an intriguing possibility. Green does have a no-trade clause. I don’t expect Howard to be traded at the deadline, lets get that out of the way. But – especially if he’s not claimed by the Vegas Golden Knights in the expansion draft this summer – the Wings are going to have quite the logjam in goal to deal with, plus a lot of money dedicated to goalies. Clearing that up sooner rather than later would be to Holland’s benefit, so he should be trying to move Howard now. Of course, Howard is currently hurt and has no timetable for return, so pulling off this move would be near-miraculous. My prediction? Vanek and Smith or Ott get traded. Maybe Miller, especially if Ott stays. Detroit forward Gustav Nyquist has been suspended six games for high-sticking Minnesota’s Jared Spurgeon in Sunday’s Red Wings – Wild matchup. Six game suspension for Nyquist. I’m surprised it wasn’t more but the last similar instance was also six games so at least DoPS is consistent this time around. Just hours after I posted my proposal for a Mike Ilitch memorial patch, the Red Wings unveiled what the team will actually wear. Surprising no one, it’s another “text-in-a-box” patch. Since the 1998 season and the “Believe” patch, the Red Wings have unveiled six special event patches. The 75th anniversary design was worn only for a few games. The “Farewell to the Joe” patch was abandoned. All of the rest (the BM/RS/SL patch, jersey retirement patches for Steve Yzerman and Nicklas Lidstrom, and memorial patches for Gordie Howe and Mike Ilitch) have been some form of text inside a box. I think it’s lazy and not a fitting tribute. The Red Wings are expected to reveal an on-jersey tribute to owner Mike Ilitch, who died last Friday at age 87, tonight as they host the St. Louis Blues. I’ve commented before on the Red Wings having a tendency to make their memorial patches “text in a box” and I expect we’ll see something along those lines tonight. With that in mind, I’ve put together something I’d like to see the Wings do. First off, if I were the team, I’d scrap the Gordie Howe patch (which I never liked anyway) and make a combined patch for Howe and Ilitch. I’d put this new patch on the shoulder and restore the “Farewell to the Joe” patch to the opposite shoulder for symmetry. Since the arena patch is probably gone for good, keeping the memorial patch on the chest is also feasible. 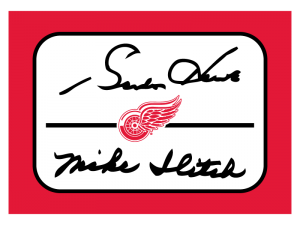 My idea for a Gordie Howe / Mike Ilitch memorial patch. The patch would feature the signatures of the two men, one over the other, separated by a black band with the Winged Wheel over it. I thought about using the blue from the “Believe” patch the Red Wings wore in honor of Vladimir Konstantinov and Sergei Mnatsakonov and the “BM – RS – SL” patch memorializing Brad McCrimmon, Ruslan Salei, and Stefan Liv, but ultimately went with black because I thought the signatures should be black and didn’t want to introduce an additional color. I have no idea what the team will actually do and I doubt it will be this. I suppose we’ll see in the coming hours. Sad news from Bill Shea of Crain’s Detroit Business as Detroit Red Wings and Tigers owner Mike Ilitch is dead at the age of 87. Detroit Tigers and Red Wings owner Mike Ilitch, co-founder of Little Caesars, has died at age 87, the Ilitch organized has confirmed. Ilitch’s dedication to his teams and his relentless pursuit of championships for the Red Wings and Tigers is legendary. Our condolences to the Ilitch family. Red Wings’ defenseman Jonathan Ericsson is seemingly done for the season, having suffered a fractured wrist in last night’s game against the Washington Capitals. Technically the Red Wings could make the playoffs and advance to the Eastern Conference Finals and Ericsson would have recovered in time to rejoin the team, but I don’t see that happening. The positive in this is that it clears a roster spot and some cap space for the rest of the season. Jimmy Howard‘s return will no longer be an issue and guys like Ryan Sproul and Xavier Ouellet should get more playing time. Ericsson’s play has been criticized for years but he’s been somewhat better this year. Losing him will hurt the Wings’ defense but I’ve written off the season already so I don’t see that as a big deal. Additionally, his contract makes him virtually untradeable so it’s not like he’d have been dealt at the trade deadline for future assets. The good news – and I use “good” very loosely – is that the Red Wings gave up enough goals to Washington in the third period on Thursday that the game didn’t look close. Early in the period they were tied at three but badly outshot and badly outplayed. One of my concerns as the Wings go down the stretch is that they’ll play just well enough – or even worse, have results that look just good enough – for the front office to think big changes aren’t necessary. Outcomes like tonight help highlight how outclassed the Wings are against the NHL’s elite. Holding Alexander Ovechkin to no shots doesn’t mean a lot when you lose 6-3. Of course, it doesn’t help that they lost Jonathan Ericsson to injury early and that Petr Mrazek didn’t play well. But that’s going to happen every now and then. Unrelated unpopular opinion… The Capitals’ throwback jerseys look horrible. I loved them in the ’80s. They’re dated as hell now. Their standard set is pretty horrible, too, though.